Released in 2002, directed by Tommy Lee Wallace, John Carpenter’s Vampires: Los Muertos feels like it was actually released in the late 80’s. Dated looking and cheesy in effects, this vampire flick stars Jon Bon Jovi as Derek Bliss, a vampire hunter for hire. After being introduced to his ninja skills in the graphic opening scene, Bliss finds himself with a new job. He is sent to Mexico to find a few fellow hunters and kill off a slue of vamps that are ravaging villages with abandon. Oh and yes you read correctly. Jon Bon Jovi is the lead. Interesting casting to say the least. In his search for other hunters who are to join him, he finds they are being slaughtered just before he reaches them, so instead he picks up a motley crew of characters along the way to help him on his new hunter job. Father Rodrigo (Cristián de la Fuente) whose entire clergy of priests were slaughtered, Zoey (Natasha Gregson Wagner) a half breed vampire of sorts who was bitten but doesn’t truly turn due to medication she derived from Mexico City, and Sancho (played by a young Diego Luna), a sixteen year old boy from the village out to prove himself. A last minute edition to the group, Ray (Darius McCrary) is a fast talking, gun slinging hunter who adds the comedic element to the crew. A films standard formulatic group of opposing characters who band together for a higher purpose is complete. All these actors actually lend a crutch to Bon Jovi’s performance, for just like the stakes they drive through the vampires they kill, Jovi’s acting abilities are wooden at best. He gets an A for effort, but a C in delivery. Surprisingly enough, Vampires: Los Muertos is entertaining. There is a solid plot to speak of, albeit no real history into the characters themselves. Instead of pondering on your lack for empathy for the characters, you’re driven to watch this film just to see how they will fair with their deed. Their bumbling antics and their will to try their damndest for justice sways you to jump onboard on watch their plight. It sure isn’t the dialogue or cringe-worthy gore…because it’s just not there. The blood is thrown about slap-happy for obvious effect (think 1980’s campy gore) and the fighting scenes are lackluster. Una (Arly Jover) the main vampire who needs to perform an ancient ritual in order to walk in the daylight toys with the team in would be game of cat and mouse, but it’s more like five year old hide and seek. Her slight frame is anything but menacing, she barely speaks a word and when she does it adds nothing to the scene. Maybe if they added some prosthetic pointy ears or gave her better fangs she could have carried off the ‘30 Days of Night’ look and added some intensity to the film, but alas this was not the case. The way the vampires instantaneously ignite under the sunlight on patchy areas of their bodies and extinguish as quickly as they burn was quite absurd. The pyrotechnics was not a strong point at all. However the film paid homage to German and western Slavic vampire folklore by depicting the necessity of decapitation as a way to commit the final coup de grace for a vampire. Heads rolled and flung far like rubber band balls. 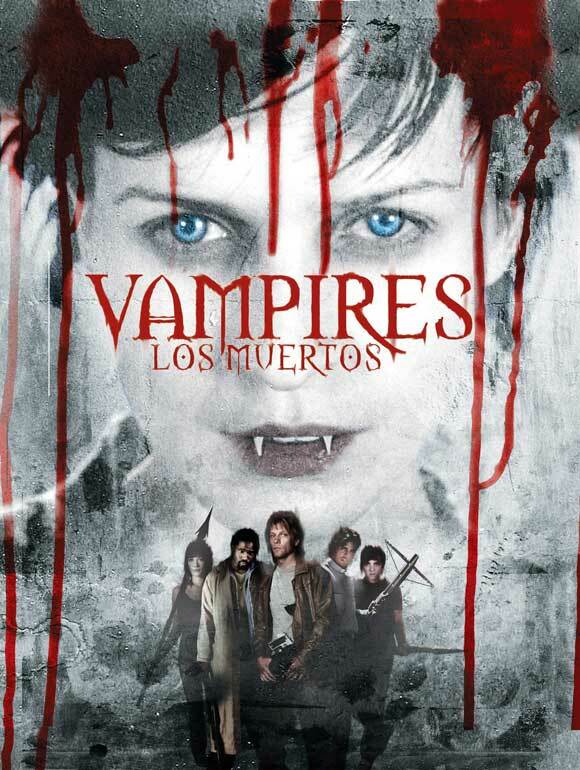 Vampires: Los Muertos is more like a made for TV movie than a big screen film, which is why it went straight to DVD in the States. It was released in theaters in Spain and made a mere €161,720 opening weekend. For 93 minutes of light vampire fair it holds it’s place on the B Movie shelf proudly. Trivia: Natasha Gregson Wagner who played Zoey is Natalie Wood’s daughter.